Killer Klowns From Outer Space (1988). Grant Cramer, Suzanne Snyder, John Allen Nelson, John Vernon. Rare rolled mint copy for this cult title. Size: 27 x 41 inches (68.58 cm x 104.14 cm). Condition: near mint-mint and unused. 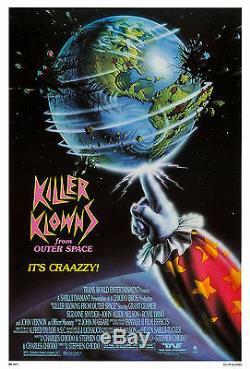 The item "KILLER KLOWNS FROM OUTER SPACE (1988) ORIGINAL MOVIE POSTER ROLLED RARE" is in sale since Friday, March 31, 2017. This item is in the category "Entertainment Memorabilia\Movie Memorabilia\Posters\Originals-United States\1980-89". The seller is "moviepostercenter" and is located in California. This item can be shipped worldwide.